How’s it going my fellow health nuts? This is your host Hercules back again on a sunny day with an Air Water Life ionizer review. Click here if you want to see my other Aqua Deluxe reviews before moving forward. 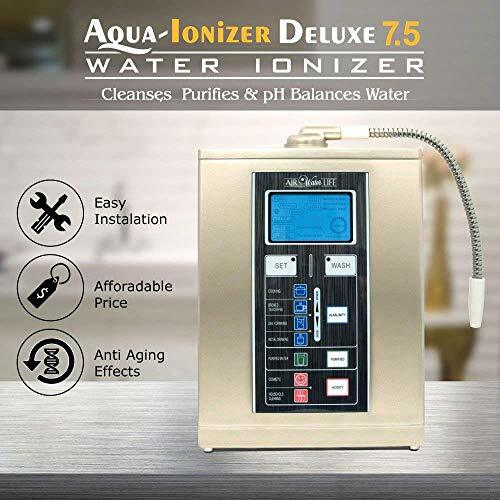 If not, the following is my Aqua Ionizer Deluxe 7.5 review. This is my fourth Aqua Deluxe Ionizer review and a return to the Aqua series after reviewing two IONtech ionizers. This 7.5 unit is priced between the Aqua 7.0 and Aqua 9.0 ionizers and should be the perfect fit for you if you’re torn between the 7.0 and 9.0 units. At first glance, the 7.5 appears to have the same body as the more expensive 9.0 unit but not the same number of platinum-coated titanium plates. In my review, I’ll show you side by side comparison of the Aqua 7.0, 7.5, and 9.0. I’ll also list all the 7.5’s features, discuss filter replacement, installation, warranty information, and my favorite part, what people are saying about the 7.5. Below, I will go over all the features and options you will find on the Aqua Deluxe 7.5. What are people saying about the Aqua Deluxe 7.5? As you can see, the 7.5 is pretty much the 7.0 with a golden body. It reminds me of the iPhone gold color. The 7.0 features a blander greyish plastic body that won’t light up the kitchen quite like the 7.5. If you care about the machine’s looks but don’t think the extra cost of the 9.0’s features are worth it than the 7.5 is perfect for you. The 7.5 looks much nicer in today’s modern kitchens with stone finishes. Now I will summarize the 7.5’s features. In this review, I won’t get as detailed in the features section as usual. If you want to read more complete details of each feature, I recommend clicking here to read through my Air Water Life reviews for the 5.0, 7.0, and 9.0. The 7.5 comes with a “no-hassle” Air Water Life lifetime warranty. The warranty for the 7.5 appears to be the best of the bunch. If you discover any defects with the unit for its entire life, the experts at Air Water Life will cover the costs. In my opinion, the 7.5 unit has the most attractive body of all the Air Water Life units, even the more expensive 9.0 unit. I’ve read that it’s nearly “bulletproof,” which means you’re buying a sturdy unit. The LCD screen has a filter replacement alert and an option to push a button to turn on the wash cycle. As the name suggests, the 7.5 unit has 7 platinum-coated titanium plates. These metals are the reason the unit lasts a lifetime because of their amazing ability to resist corrosion. All of Air Water Life’s ionizers use one activated carbon filter. Most people will only need to change the filter once per year. People with hard water might need to change the filter twice per year. You can also opt for three-stage pre-filtration to extend the life of your carbon filter and reduce the chance of buildup inside the unit. The 7.5 unit produces water in a pH range of pH 4.0 to 11. The ORP range of the water made by the 7.5 is +1000 to -800mV. The negative numbers are what we are looking for. The lower the negative number, the more antioxidants in the water we drink. 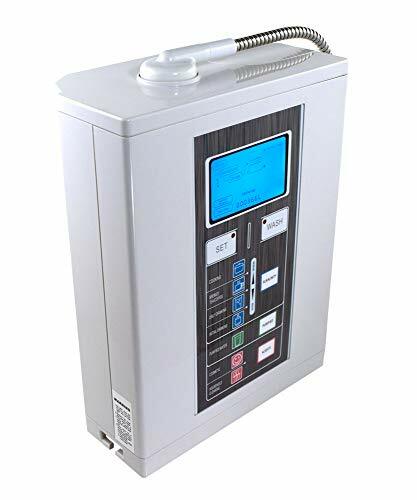 I’ve read hundreds of reviews written by owners of the Air Water Life series of ionizers, and almost everyone has said that the installation was a breeze. Below, I post an instructional video of the installation process. 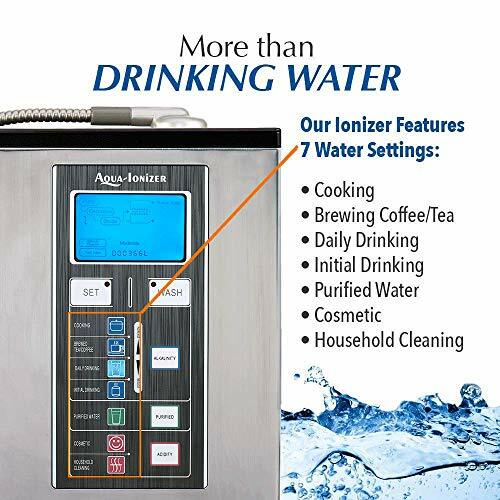 The 7.5 features 7 water settings: 4 alkaline levels, 2 acidic levels, and one purified water option. The acidic water you can use for cosmetic use or household cleaning. The acidic water is antiseptic. You can save money by skipping over the cleaning products with harmful chemicals in them. The 7.5’s dimensions are 8.25″ Length x 4.3″ Width x 13″ Height. 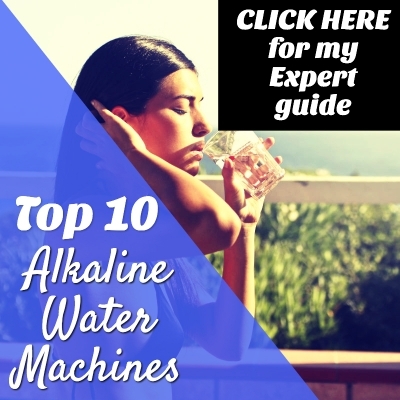 Every premium alkaline water machine I’ve reviewed has a self-cleaning function. Each time you start the 7.5 or shut it off, it will clean itself. It also has this cool feature that some science geeks like me might appreciate. If it runs for fifteen minutes straight, the machine switches the polarity in the titanium plates to keep the plates clean. The Aqua Deluxe 7.5 weighs just 8 pounds. People who are considering traveling with their ionizers should put the 7.5 on their lists. The Deluxe 7.5 comes with a universal adaptor for countertop installations. If you choose to install the unit under the sink, you need to purchase a faucet kit and may need an expert to complete the installation. Air Water Life provides an instructional video that shows you exactly how to install the unit on your counter. The universal adaptor that comes with the unit should fit any sink. Some people prefer to install the unit away from the kitchen at a utility sink or in the bathroom. Installations away from the kitchen are 100% possible. If you want to save counter space don’t think that you have to install the unit in your kitchen. Now, if you have the extra scratch and prefer to install the unit under the sink, you can check out the attractive Under-Sink Aqua Ionizer Deluxe Water Ionizer Adapter Faucet produced by Air Water Life. 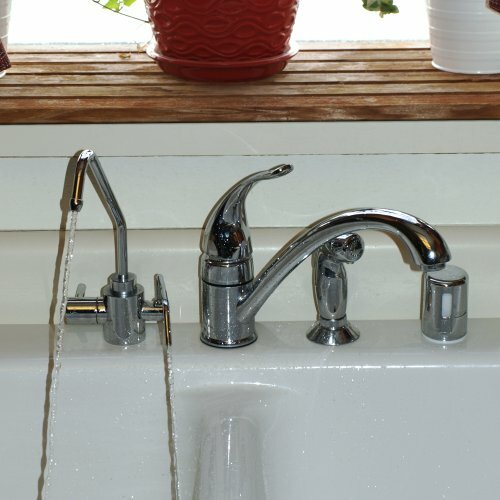 Check out a photo below of the faucet. When you purchase the Aqua Deluxe 7.5, you get one free activated carbon filter. The filter lasts most people a full year unless you have hard water. Air Water life advertises a filter life of 4,000 liters or over 1,050 gallons. Just imagine, you get 3 gallons of pure alkalized water per day for a full year before needing to change the filter. Not bad. 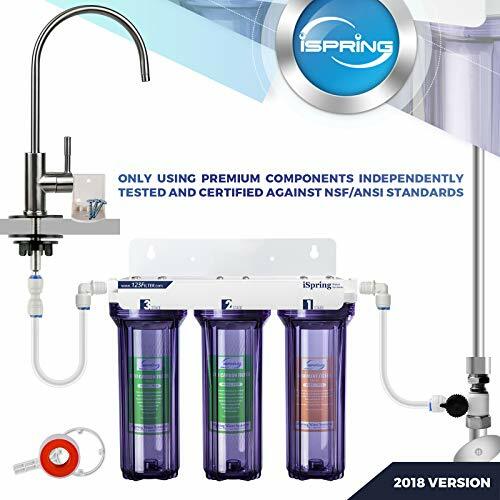 As I mentioned earlier, if you have hard water, it’s worth taking a look at the three-stage prefiltration systems. In my mind, the purer the water the better. With the three-stage filter system, by the time the water hits your glass, you’re getting premium water that you’d never be able to buy in the store. 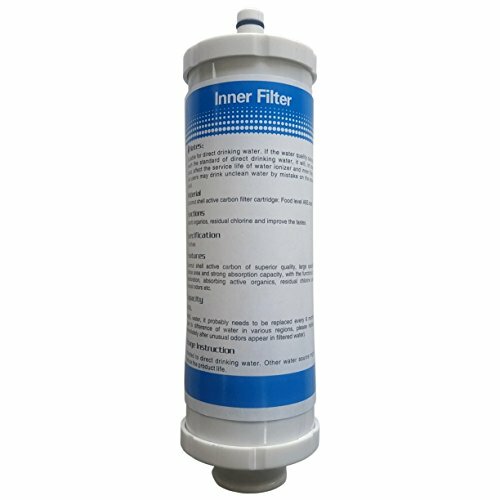 Click here to check out an affordable three-stage filtration system with great reviews. The Aqua Deluxe 7.5 appears to be the newest addition to the Air Water Life family and doesn’t have the same number of reviews as the 5.0, 7.0 and 9.0. One person reported using the Aqua Deluxe 7.5 with his whole house water filtration system and under the sink filter. He’s amped about the supreme quality of the water he and his family are drinking every day. Air Water Life is known for providing superior customer service. They provide a toll-free number and are quick to respond to any questions or problems you may face. The 7.5 currently has only five-star reviews written by verified purchasers only. One of the reviewers is a doctor who had one word to say about the unit: “incredible.” Considering Air Water Life is a legit outfit, this review doesn’t appear to be planted. One woman reported a very accurate pH of her alkaline water, and she’s been using the 7.5 for over a year without a hitch. She loves the 7.5 so much that she bought her daughter one for Christmas. What better gift to give than one that can boost your family’s health? Another user noted that she saved thousands by buying the Aqua Deluxe instead of the more expensive Kangen. One man said he was drinking alkaline water just 30 minutes after the package arrived! A “smoothness” to the water and “top shelf” taste. You will save enough money in just one year to pay for the unit. What type of alkaline water benefits should you expect to experience with the Aqua Deluxe 7.5? Win the battle against free radicals that cause aging by drinking the antioxidants in every glass of your alkaline water. Take your daily detox to the next level. In today’s world, it’s more important than ever before to have a gentle daily detox plan. Reverse harmful acidity in the body that causes pain, digestive problems, acid reflux and other internal disturbances. Recover quicker after gym sessions or hardworking days with the electrolytes in the water. The Aqua Deluxe 7.5 is perfect for people who want a premium unit but don’t want to spend the extra money on the Aqua Deluxe 9.0. You also get the lifetime warranty, which means you have a guaranteed unit for life. Imagine all the money you will save over the life of the 7.5. Like I said before, the 7.5 is the most attractive unit of the bunch, but it doesn’t have the 9 plates included in the 9.0 unit. Despite two fewer plates, current owners are reporting a superior tasting water that is making their days better. The woman who loved the unit so much that she bought her daughter one is what the alkaline lifestyle and my site are all about. My aim is to promote health without telling anyone to do anything. In health, it’s important to lead the horse to water without forcing him to drink it. In my case, alkaline water is one of those daily health boosters I can’t live without. When you feel great, you emanate a certain energy that translates as beautiful. I don’t care if you have the standard beauty or not; it’s that X-factor that comes through, and the basis of that is good health.